Street level view of Southern Land Co.'s proposed tower at 1911 Walnut St. Even without a high-ranking salary, you may be able to afford living in a brand-new luxury Rittenhouse building. 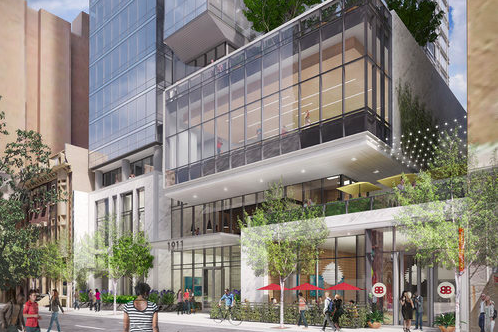 In the months since the plans for 1911 Walnut – a multi-use building project slated for a gym, retail and apartments – have been revealed, it has undergone several versions. The most recent, solidified at a meeting Tuesday with the Philadelphia City Planning Commission, will include a number of mixed-income housing units listed below market value. These units are in addition to the previously announced 28 mixed-income units that will be placed in the project's shorter tower; these additional units will be housed in the 48-story high-rise component. PlanPhilly reported that developer Southern Land Co. is required to include a 10 percent minimum of affordable units to access zoning bonuses. “After three years of working with the community on this, I’m really proud of the consensus,” Tim Downey, CEO of the Southern Land Co., told PlanPhilly. “I’m not sure in my career if I’ve ever been able to put together anything like this. I think the affordable housing at this location is really neat. My personal belief is that sometimes dollars can’t be measured in terms of putting affordable in a nice part of town." Rittenhouse is one of Philadelphia’s most expensive neighborhoods for rent, behind only Logan Square and University City, according to a recent Zumper report. The median rent for a one-bedroom apartment in Center City West is $1,780, according to the site. It wasn’t until 2014 that Philadelphia got its first development that met the 10 percent quota of below-market pricing, at 205 Race St. More developers in Philly and elsewhere are considering this option to increase density and, thus, circumvent zoning laws that would curtail the square footage of developments. To qualify for the affordable units at 205 Race, prospective single residents should make no more than $44,150 annually; a four-person family income is capped at $63,050. Rent for a two-bedroom affordable unit was initially listed at a maximum of $1,135. It’s not clear yet what pricing can be expected at 1911 Walnut, but it’s worth noting that it’s not actually related to the market rate rent, but rather to the Department of Housing and Urban Development, which determines the prices based on the region’s income levels.